Belfast, and all of Northern Ireland, has come a very long way in a very short period of time. In the not so distant past, I would never have considered visiting the capital of Northern Ireland; memories of past violence still too vivid. Those days are long over though and today Belfast has emerged as one of the hottest travel destinations in the world. The city of Belfast is colorful and dynamic, seemingly in a state of progress and upward mobility. Times have never been better for tourists to this great city and I loved every moment of my first visit there two years ago. My love for the city though was recently tested when I attended a conference in Belfast. It was a great opportunity for me to see if my admiration for the city was a one-off experience, or if I well and truly do love Belfast. I know it’s important for travelers to revisit places, even ones they like and I couldn’t wait to see what I thought about Belfast the second time. Since tourism in Belfast is on the rise, so is the construction of new hotels. The hospitality scene in Belfast is changing and changing fast and I wish I had more time to experience some of the great properties around the city, but the ones I did visit impressed me in every way. On my first trip to Belfast I stayed at the famous Europa Hotel. At one time considered to be the most bombed hotel in the world, the Europa was very much at the center of violence during the Troubles. The hotel has hosted dignitaries of all kinds from all over the world, including former President Bill Clinton, whose room has since been renamed the Clinton Suite. Aside from its storied past, the hospitality and comfort I experienced at the hotel were all top notch. On my most recent visit, I experienced a range of different hotels, starting with the new AC Hotel Belfast. 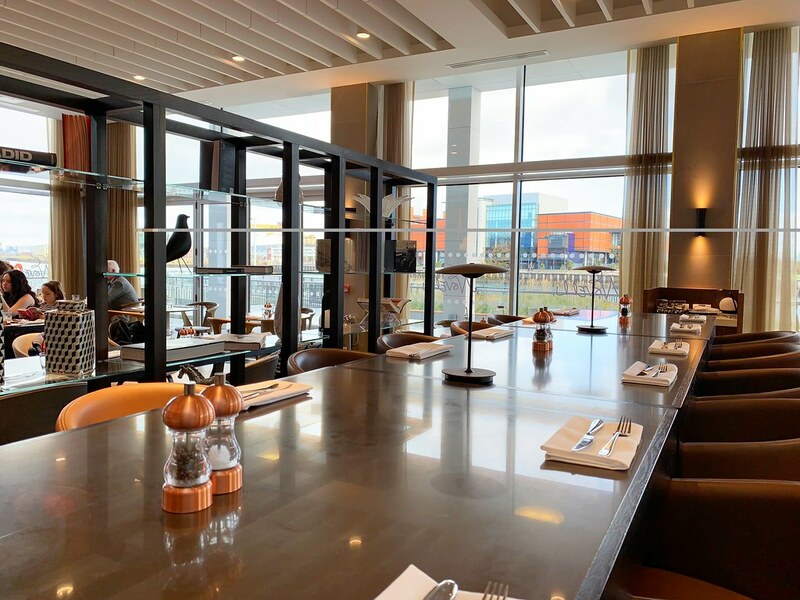 Part of the Marriott family, the AC Belfast enjoys a fantastic spot right on the water with amazing views of the nearby Titanic Quarter. The hotel is contemporary and modern, featuring spacious rooms and a common area that is warm and welcoming. The food at the AC Hotel Belfast was an unexpected surprise, featuring fun and creative food and a restaurant that seemed to host more locals than visitors, which is frankly a great sign. The Grande Dame of the luxury hotel scene in Belfast though is the Merchant Hotel. Located in the beautiful Cathedral District, the hotel was originally built as the headquarters for the Ulster Bank in the 19th century. Because of that, the architecture and design of the hotel is impressive, and it has thankfully been preserved today. Transformed into a five-star hotel in 2006, the property is remarkable in every possible way and even if you don’t stay there, be sure to stop by to marvel at the intricate Victorian design. One thing that deeply impressed me on my first visit to Belfast was the incredible food offered all around town. A legion of creative chefs have opened restaurants, bars and cafes in the city and the food scene, I think, is one of the best in the world. My only regret is that I didn’t have more time to eat my way around town, but what I did enjoy proved to me that there’s some amazing stuff going on in the city. Two restaurants in particular deserve some attention. The James Street Bar + Grill is consistently ranked as one of the best restaurants in town, the chefs from here have gone on to great things around the city and region, proving the stellar cooking chops of the restaurant. I went slightly traditional during my dinner, enjoying a schnitzel and selection of homemade Irish breads, a hearty and delicious way to start off my culinary journey through Belfast. Another new city favorite is Home Restaurant, which actually started off as a pop-up concept but proved so popular that it is now a part of the local neighborhood. Enjoying a great location in Belfast’s Wellington Place, Home feels just like you’re dining at someone’s house, which after all is the entire point. They also highlight healthier food choices, a nice change from my typical travel diet and a nice way to finish out my journey through the city. There’s still plenty of classic establishments in Belfast though, including those Irish pubs that the world seems to love so very much. Across the street from the historic Europa Hotel is another historic property, the Crown Liquor Saloon. This classic Victorian establishment has suffered a lot in its long history, dating back to 1826 it’s actually now owned by the National Trust. It’s also a fun place to relax, unwind and enjoy the true essence of Irish pub culture. Honestly, there’s a lot to see and do not only in Belfast, but also within an easy drive making the city a fantastic home base for a week of exploration. While the times of the Troubles in Northern Ireland are long since passed, it is important to learn more about this era in history and how it impacts life even today. The only way, in my opinion, is to take one of Belfast’s Black Cab Tours. Guided around former political hotspots by real cabbies, guests learn about the Troubles from people who lived through the experience themselves. It was an eye-opening morning, driving around neighborhoods I remember seeing on TV as a kid but not the quiet streets they are today, rather engulfed in flames. Touring both the Catholic and Protestant sides of town, the tour is balanced and informative, not taking sides but rather seeking to explain the roots of the Troubles to outsiders like me. This is a complicated issue and there’s no doubt tensions are still there, just below the surface, and the only real way to appreciate the historical and current events is by seeing it through the eyes of locals. This is a wonderful tour and ranks amongst my favorite tours in the world. Belfast’s biggest tourist draw is without a doubt the Titanic Exhibition. This monument to Belfast’s maritime heritage was built on the site of the former shipyard in which the RMS Titanic was built. This experience, because it’s much more than a museum, is one of the best-curated historical activities I’ve seen. It’s massive and an entire day could easily be spent walking through the galleries and exhibits, learning more about the Titanic, as well as the people who built her and those who lost their lives sailing on her maiden voyage. Its position in the shipyards is especially poignant and the entire Titanic Quarter is a nice place to explore, including the nearby SS Nomadic, the last surviving White Star Line ship that you can investigate both inside and out. Belfast is a large city and it’s one that is very much defined by its neighborhoods. Walking from the Titanic Quarter, I crossed the picturesque Lagan Weir pedestrian bridge to the recently trendy Cathedral Quarter. Named after Belfast Cathedral, the streets and alleyways that define this part of town include some of the most popular bars and restaurants in town. The establishments are fun and creative, reflecting the latest generation of young professionals to call the city center home. 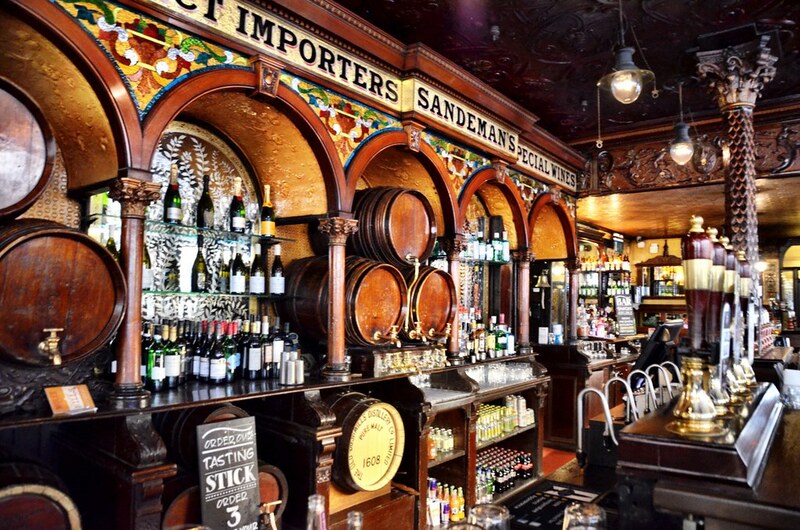 Some of the city’s oldest pubs are also found here, and the small pedestrian areas transform at night to include fun and sometimes-raucous parties that spill out onto the streets. There are many other quiet places to discover around Belfast, from the City Hall to the beautiful University Quarter. My best advice is to just wander and see what you discover on your own. After you’ve seen the best of Belfast, it’s time to head out of town and see more of Northern Ireland. Belfast is the perfect launching point to drive along one of the world’s best scenic routes, the Causeway Coastal Route. This is a 120-mile drive that connects dozens of small coastal villages and attractions, including several smaller routes connecting inland sites to the main drive. It also takes much more than the 1-day I had to devote to it. I started early, ended late and raced along the way and was not able to even scratch the proverbial surface. Honestly, if you have a week to spend driving this impossibly stunning route, take it. Go slow, stop at everything and enjoy the almost otherworldly beauty you discover along the way. Some of the many highlights include the Giant’s Causeway, beach towns like Portstewart, Ballintoy Village and the Carrick-a-Rede rope bridge. Whether it was enjoying a street art tour of Belfast, or eating my way around town, my second visit was just as memorable as my first. One of the great aspects of travel is that I never know when I’m going to fall in love with a new city, it just happens and I don’t always know why. That’s the case for me and Belfast, it’s a city that just meshes well with me and my personality and I know that I will love returning in the future to see what’s new and different.